Nearly two years since Yorick’s first Listener (No 4370, Hefbeet) with its pangrammatical substitutions. This week, clashes to be left blank initially, misprints in the definition spelling out an instruction, and the remainder where the grid entry had a wrong letter. Lots to try and separate here. I wondered if the title was a hint at the letters that it didn’t contain, like H2O. I googled UtoZ and was pleased to find that it was an alcoholic beverage from Star Wars. Water and alcohol, eh — what about AtoG? Apparently they are “small creatures known for their insatiable appetites and unusual diets”. I knew that trying to analyse a puzzle’s title too soon was a mistake. I found this puzzle about as tricky as Hefbeet, ie quite. The bottom left quadrant came together first, with the exception of 39dn. That was followed by the top right and then the top left. Progress on the bottom right was hindered by my entering BEDROOM, instead of LEGROOM, for 45ac Make fast, posh girl go over sitter’s space (7), thinking that a deb was a posh girl. That said, the top left also gave me a headache. I had SEA SALT and BASIS clashing with OBIA at 4dn Charms ending in many complaints (4). I had it in my head that obia was the plural of obi, not just an alternative spelling, and that the complaints were all the phobias people have! It turned out to be OBIS entered as OSIS (as in thrombosis. I also failed to notice that I still had LEAO at 38dn instead of LEAH. All this meant that I only had SOMUR as the letters of the thematic item that we had to draw. The instruction spelt out by the correct letters of the misprints was Draw five shapes through names and blanks, so careful examination of the remaining clues and entries revealed my mistakes, and RHOMBUS was finally teased out. 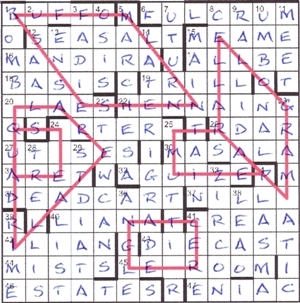 There were some fine clues in this puzzle. My favourites were 17ac Even in old Lincoln, say Low Latin parts (5) for ALL-BE — LL in ABE; 5dn Peruvian lady might be one step ahead of El Salvador associate (8) with Peruvian being the misprint for Perugian — MARCH (step) in front of ES (El Salvador) A (associate); and absolute favourite 42ac From the city of Paris, the king’s won back secure independence (5) where the definition was From the city of Paris, the king’s son with just back nail independence being the wordplay! So the grid was completed, and the letters in the title soon led me to the Q in column 1 which SQUARE could include. It didn’t take long to find the other four-sided figures spelt out in the grid: PARALLOGRAM, QUADRILATERAL, RECTANGLE, and TRAPEZIUM. Brilliant! All that was left was to draw a rhombus so that it was separate from all the other figures that I had drawn. Well, the area of a rhombus is base × height and we were told it had to be “an area equivalent to 20 cells”. 5 wide and 4 tall would enable two right-angled triangles of size 3, 4 and 5 on either side of a 4×2 block to give the required area. The only place this would fit started in the top left square. How satisfying all this was, and how impressive the finished diagram appeared. Many thanks for a fine puzzle, Yorick. More, please. This entry was posted on 15 September 2017 at 4:00 pm	and is filed under Solving Blogs. Tagged: PQRST?, Yorick. You can follow any responses to this entry through the RSS 2.0 feed. You can leave a response, or trackback from your own site.